There are traditional quartets and contemporary quartets. 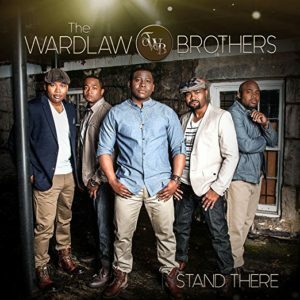 On their new album, Stand There, the Wardlaw Brothers fall within the contemporary category while maintaining links to the traditional side. The album also demonstrates the group’s maturing style as defined by its robust harmonies and song quality. The most surprising aspect of the album, and the most gratifying, is the a cappella singing. The album begins with a snippet of TWB moaning like they are leading an old-fashioned church service. Later, we hear “Only Believe,” a song awash in richly textured harmonies, including the bass voice. The song is slow, serious, and steadfast in its message of personal encouragement. The brief interlude, “Everything to Me,” is another a cappella gem, with the group approaching Take 6 complexity. This piece could easily have concluded the project, but this task is given to Martin Luther (“Lute”) Wardlaw’s testimony on “Lean on Him.” Here, he gives general reference to the discouragement and serious challenges he and his family have been through, but also the healing power of prayer. One senses that these challenges inform many of the songs. For example, with its foot-stomp tempo and earthy harmonies, “God Has Kept Me” chronicles a litany of personal trials and disappointments but with the title retort: “Every time I almost let go, God has kept me.” It is the album’s first single and the most akin sonically to the traditional leaning intro. “All of Me,” “I Believe in You,” and “In Awe of You” have P&W shades, while “Highest Praise,” with Dorinda Clark-Cole, is conventional rhythm and praise. The title track offers James Fortune-esque musical drama that underscores Luther’s later testimony. With one exception, Luther is the sole composer of the songs on Stand There (brother Tony assists on “Only Believe”). His talent as a songwriter is best demonstrated on the pop-inspired “Angel’s Wings,” “Because of You,” and “Heaven,” featuring Fred Hammond, which lyrically evokes James Cleveland’s “That Will Be Good Enough for Me” in its disdain for worldly goods in favor of eternal blessings. Stand There is the most musically diverse of TWB projects, but it is also their best album to date.